Flashing is an important part of any shingle roofing system. Thin metal sheets that overlap with shingles are covered under siding and seal in the space between the shingles and the wall to prevent leaks. 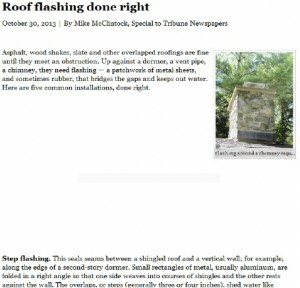 A recent Chicago Tribune article describes the key features of this important roofing element. Step flashing. This seals seams between a shingled roof and a vertical wall; for example, along the edge of a second-story dormer. Small rectangles of metal, usually aluminum, are folded in a right angle so that one side weaves into courses of shingles and the other rests against the wall. The overlaps, or steps (generally three or four inches), shed water like overlapped shingles. A roofing nail high on the wall-side fold of each piece will be covered by siding. The roof side floats in the shingles without nails. You can make your own or buy them precut and prefolded. For backup protection consider a layer of modified bitumen installed on the sheathing. The self-sticking, rubbery sheets also protect valleys and eaves as a backup against ice dams. Flashing covers the gaps between the roof-covering material and the wall, which is why homeowners can’t afford to skimp on proper flashing installation. It only takes one botched job to ruin flashing for good, which could lead to destructive leaks. Homeowners who lack the training and experience in flashing installation should instead turn to a Federal Way roofing contractor such as Tedrick’s Roofing. While it may seem like an easy enough task to cement or caulk the seams between the roof and the wall, keep in mind that extreme temperatures can cause both the roof and the structure to which it’s connected to expand or contract. The wrong type of flashing will crack and split if it can’t keep up with the rate of thermal expansion and contraction. When it comes to durable roofing in Federal Way, WA, flashing may occasionally need to be replaced rather than re-used. A thorough inspection should reveal the extent of damage your roof’s original flashing may have sustained over the years. For high-quality flashing installation and replacement, turn to reputable local contractors who are known to offer a wide range of flashing materials that are suitable for the prevailing weather conditions in your area.